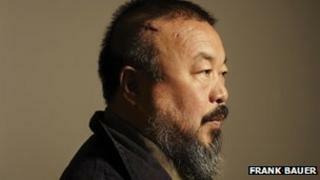 The story of the arrest and detention of Chinese artist Ai Weiwei is to be staged in London this spring. Howard Brenton's #aiww: The Arrest of Ai Weiwei is based on conversations with the artist about his imprisonment in 2011. The hashtag in the title is a reference to Ai's prolific use of the social networking site Twitter, where he has almost 200,000 followers. The play will premiere at Hampstead Theatre in April. The official announcement describes the story as "by turns surreal, hilarious, and terrifying". Ai Weiwei, an outspoken critic of the Chinese government, was detained for almost three months without charge in 2011. After he was released, he was accused of tax evasion and the authorities imposed a 15m yuan ($2.4m, £1.5m) fine. The play, directed by James Macdonald, marks Brenton's return to Hampstead Theatre following his 55 Days last season. His other recent credits include Never So Good, Danton's Death (National Theatre) and Anne Boleyn (Shakespeare's Globe). In May, Hampstead will also stage the UK premiere of Race, by Pulitzer Prize winning US playwright David Mamet. The legal drama first premiered on Broadway in December 2009.